This week's Polearm illustration isn't very exciting, but it was fairly quick to create. It's going in the weapon lists, on the Spears & Polearms page. Yes, PowerFrame is one of those RPGs with pages of weapon lists, although I haven't gone all-out with glaive-guisarmes and voulges and such! This post, I'm going to talk a bit about how the game provides interesting choices by differentiating weapon types, and how it supports you in making your own creations. The baseline melee weapon in PowerFrame is the sword. It uses your Melee Ability to attack, and your Strength Ability to do damage. Bigger swords cost and weigh more, and have bigger damage bonuses. Different weapon types such as axes, bludgeons, chains and flails, daggers, and even some sword varieties, change up not just the Attack Ability but also the Damage Ability. This also applies to ranged weapons, although things like guns and lasers (and chainsaws) do damage based on a set number, not an Ability calculation. Varying the Abilities creates a couple of interesting effects. Firstly, it serves to make the weapons feel distinctively different. Secondly, it means characters with diverse Ability choices can find a weapon that suits their style (or conversely, allows you to create a character tailored towards a particular fighting style). 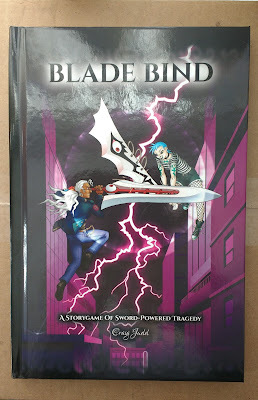 Given the other functions of Abilities such as Strength (Carry, Pushing, Grappling), Toughness (Damage Resistance, Endurance), Avoid (Dodging), Melee (Throwing, Catching), or Unarmed (Grappling), choosing a particular weapon style has other implications for a character's playstyle. While the different polearms use a variety of Attack and Damage Abilities (mostly defaulting to Melee and Strength), their main distinguishing features are the Reach and Hold-Off Attributes. Normally close-combat weapons can attack a target in an adjacent 2m Hex. Weapons with the Reach Attribute can make a close-combat attack against a target a number of Hexes away equal to the Reach rating. 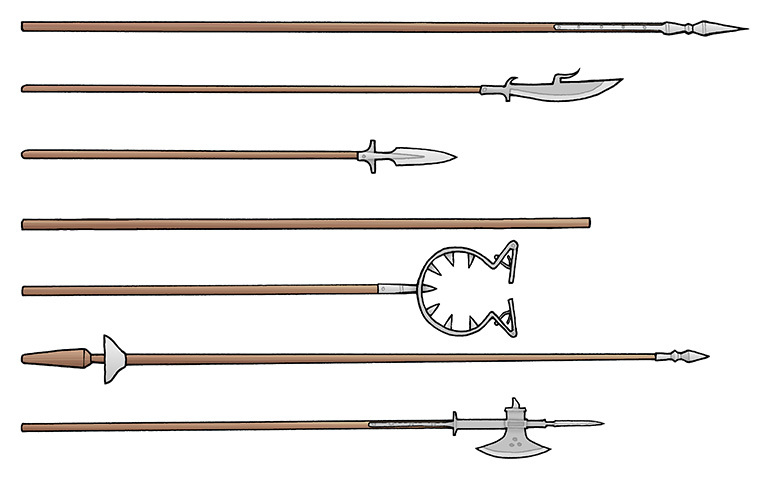 All the listed Polearms have Reach 2, although particularly long pikes might have Reach 3 or 4. When you're attacked by a weapon that has Hold-Off, it imposes a condition on your movement. For example, if attacked by a Pike you need to make a Move roll against the wielder's Melee in order to move closer to them. There is some variation; Boar Spears prevent any movement closer to the wielder, but only if you are wounded by the attack. Man-Catchers prevent all movement if you are caught by its grapple. Not all Polearms have Hold-Off. The Lance provides a damage bonus if you use it in a mounted charge. As with many of its subsystems, weapons are created using an effects-based system. All Weapon Special Attributes are listed and rated in Threat (used to calculate Experience awards from combat), so it's just a matter of coming up with a literal description of what the weapon is capable of and then going through and selecting the appropriate options. Case in point – we're just setting up to start a new campaign in a post-apocalyptic techno-gothic setting (think Vampire Hunter D). One of the guys is playing a werewolf, and he jokingly suggested he have "lightsaber claws". To his surprise I said I could stat them up no problem, but I was interested to know how he imagined them working. I think he's either gone with fingertip implants, or some sort of knuckleduster projectors. Actually creating them was a simple matter of adjusting the Beam Sabre I already had on the weapon list. Beam Claws x2 – Attack: Unarmed, Damage: 4 (+2 for dual-wielding) Energy, Close Only, Cost 7 ea., Enc 1 ea., Threat 4 ea. It's lining up to be a pretty nuts campaign, and I'm glad to be able to demonstrate the system's flexibility and diversity. The first session is tomorrow! The next picture on my to-do list is a character who displays several nonhuman Traits, such as armour, weapons, and wings.